Yes yes yes…after so many years I had a great sense of satisfaction today. I, briefly, for about 2 minutes felt like the happiest man on earth. 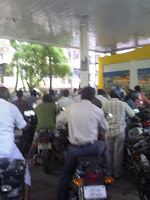 Yes, I was able to get some petrol filled in my bike after waiting for 20 minutes. Oh cmon, 20 minutes is not a big deal. I got petrol!!!! Can you believe it? I was one amongst those Chennaites/Indians who achieved this astonishing feat. Well such is the hype created by the Oil Marketing Companies/dealers/Mr.Chidambaram & Co. They successfully instilled the feeling that we are consuming the last few drops of available crude on earth. Yeah now every one in this country tracks crude prices on a daily basis. And inflation has become a house hold term. I never used to understand that term for some time until I realized that the 100Rs credit in my bank account is actually worth 90Rs when I withdraw it from the ATM a week later. The beggar at Teynampet signal no more accepts one rupee. He says “Sir, the one rupee you give becomes 90 paise when it reaches my hand. I can’t buy even a water packet for that amount”. Thanks to US dollar and crude prices, we understand economics a lot better these days. Well no one actually knows how much of crude is left down below. But available estimates (read “under estimates”) says Saudi has supply left for 97 years, Canada has reserves for another 80 years or so and there are other nations like Iran, Russia, Nigeria, etc with supplies left. That gives us ample time to switch to alternate sources of energy. With current demands, we still have lot of time to invent technologies for alternate energy sources before earth depletes out of crude. Uff, and the truth is that 11% is not the actual inflation number in India. Because I heard that in India inflation is calculated based on Whole Sale Price index which is not the price at which you buy at the departmental store. That’s the whole sale price of the commodity you buy. So the actual number is somewhere around 25% is my guess. And yeah the biggest worry for Manmohan Singh & Co. is convincing the left for the nuclear deal. I mean, probably nuclear deal can give us little bit of energy security. Still, India would be importing heavily on the crude side. You are not certainly going to run your two wheelers and cars with nuclear energy. So why not first solve the problem on hand? And why not heavily invest on technologies for alternate energy sources to make India energy self sufficient, say, by the year 2020? But I think the only worry point of the UPA government is whether to go for elections in October 2008 or May 2009. The Oil Marketing Companies have already switched to 7AM – 7PM working hours in the city; I am not sure about the highway scenario. And some companies sell only premium brand of petrol on which there is no cap at max price. Every one understands that this has a multiplying effect to the amount of rice and dhaal one eats every day and in some cases the number of meals one eats in a day. Of course you just cannot control crude prices as it is an international factor. But certainly you have to look at other options that are within your control. I am sure you can clean up a lot of things in domestic market. Like the whole sale price is fixed by the government. This is the rate at which farmer has to sell it. From there are on so many middle men speculate the market and dictate the price of food items. And there is so much of food items blocked just to be sold at higher prices. I am just giving couple of examples where cleaning can happen. I am sure there are many more such scenarios. But I know the reality. These things are not going to change. The change would be in IT professionals’ salary structure. Along with CPI (Company performance variable), VPI (Vertical performance variable), IPI (Individual performance variable) we are going to have one more: ICPI —> International Crude Performance Variable. Next Post I just cannot stop..
Nicely written. Good rational thinking.